Disappearing 9-Patch is quite popular. My blog tutorial for this quilt style made with 10″ precut squares, Layer Cakes, is one of my most popular. Readers and quilt class students often ask how to create the Disappearing 9-Patch with Layer Cakes in a smaller size. Well, I have great news! This tutorial will show you how to create TWO small quilts from one precut fabric bundle and a small bit of yardage. Don’t you love that bright layer cake? Fabric designer, Patty Young of Mod Kid Boutique, asked a few pattern designer/bloggers to take her beautiful new collection for Riley Blake for a test drive. I’m thrilled to showcase her line Flit and Bloom in this tutorial. 1 Layer Cake* Flit and Bloom by Patty Young is featured in this tutorial. *Layer Cake is a precut 10″ x 10″ square fabric bundle with at least 40 pieces. 40 pieces are used in this tutorial. The term “layer cake” is a trademark of Moda Fabrics. TIP: Using a large cutting mat, stack sets of strips to make faster cuts. Remove two 10″ squares from the precut pack. In this case, I removed the Bloom Scalloped Dot, since it is going to be used elsewhere in the quilt design. These two will not be used. Also count out eight white squares. Set these aside. You will use them. 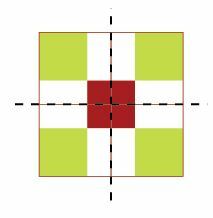 Make eight basic, although GIANT 9-patch blocks using four white squares and five prints. Stitch using a 1/4″ seam allowance. Grab a Seamingly Accurate Seam Guide to make sure your 1/4″ seam is always accurate. Chain-piece 24 pairs of print and white fabrics. Grab them at random. No need to plan colors at this stage of the game. Cut the pairs apart with scissors. At this point, you will have 16 unstitched prints. And, don’t forget the 8 white squares, which you set aside earlier. Sew a print OR white to each of the 24 pairs. Keep the alternating pattern. Print-White-Print OR White-Print-White. Now, create a basic 9-patch block using these three-piece units. Make eight total huge blocks. Slice each 9-patch block into perfect quarters. Honestly, this is the hardest step because you’ll want to make sure you cut the pieces exactly in half, and you’ll need a large space to rotary cut them. Start by folding the large block in half, making sure the vertical seam lines lay on each other. You’ll be able to feel a little ridge where the seam is underneath what you can see. Using a large ruler, line up one vertical seam line with the 4-3/4″ mark. Cut. Open, turn and layer the halves, matching seam lines again to make the second cut. Wow. These are BIG quarter pieces. This tutorial makes TWO quilts. Each quilt will use 16 quarter-squares laid out in a 4 x 4 grid. Every quarter will be used. Start by sewing pairs of quarters in the exact same arrangement. See the small square in the northwest corner of block one and southwest corner of block two? Stay consistent when sewing all pairs in this fashion. Once the pairs are stitched, join two together to form a four piece row. Add them to a design wall, large table, or floor to arrange the colors and focus fabrics. Each quilt will only have four rows, and alternating rows will be flipped 180 degrees (from the image shown above). This will make sense as you lay it out. From each of the 2/3 yard grey and pink fabrics, cut six 4-1/2″ x width of fabric strips. From each of the 1/2 yard binding fabrics, cut six 2-1/2″ x width of fabric strips. Each quilt should be approximately 56″ square right now. Sew two sets of border strips together at the short ends. Apply to the right and left sides of the quilt. Sew excess to remaining two border strips. Add each of those to the top and bottom of the quilt. Each of these tops were finished with different quilting designs. The quilt with grey borders got a special treatment with wishbones the border, teardrops in the corners, and a swirl edge-to-edge (e2e) design. The quilt with pink borders has only a swirled flower edge-to-edge (e2e) over the entire quilt. There was no special border design treatment. Use your favorite binding method to apply continuous binding to each quilt. Thank you so much for browsing and stitching this tutorial! Is it possible to make this quilt larger like for instance a queen size? Yes. This tutorial is set up to create two, so you can use the whole layer cake package. I don’t see any mention of the backing fabric for this quilt. I’m new to quilting and if this is something that “everyone knows”, please excuse my ignorance. But I also need to know how much backing fabric to but as well as how much batting is needed? Thank you! If I wanted to make a king size version of this, do you think by switching the blocks so that there are 5 white squares and 4 layer cake squares, it would add enough length and width without having to add a very wide border? I love this idea! I have 2 layer cakes of the same material and have been waiting for something special. I think with 2 layer cakes I should be able to make a king size and some pillows. Thank you for sharing this. I never thought to sue a serger. That’s brilliant!